It was 5:30 in the morning. We met our hot air balloon Masai Mara driver and were already late. As we stopped to pick up our captain, he replied “Where've you been,we're going to miss sunrise? Uh Oh. We did notice that the clerk who booked our flight crossed out the time to meet in the lobby and made it a later departure, but we didn't think much of it. We thought, “I guess the sun rises at a different time at this time of year.” Our driver rushed to the departure point and there was a flurry of activity once we got out of the truck. We have always dreamed of flying over the African savanna and there is no better place to do it. We loved our captain, Kim. He was exactly my type of guy. Tell it like it is, knows his job well, is skilled and talented and has a fantastic sense of humour. He was determined to make it up in time for sunrise and worked hard to make it happen. He was yelling orders at the group of 10 men preparing our balloon, he was running around doing much of the work himself like repositioning the fan, spreading out the balloons parachute like material and blowing hot flames into the balloon. It was incredible to watch and within a few minutes he was yelling at us to lay down in the tipped over basket and be prepared to hang on. 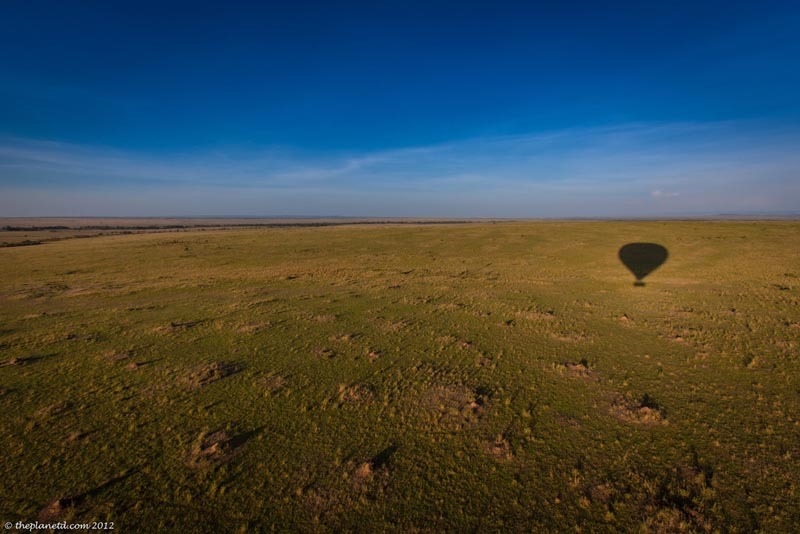 Once the balloon was nearly filled, the flight engineers all jumped in frantically to join us for a flight over the Masai Mara. The crew loved it as much as we did! Flying over the Masai Mara isn't as popular at this time of year as it is during the great migration, but it is still a spectacular experience. Since others didn't book a trip with us today, the local guys who work for the company were our traveling companions. We felt happy to know that they get to experience what they prepare each day. Did we make it up in time for Sunrise? Definitely. Captain Kim made it happen come hell or high water. It was surprising to me just how smooth a flight in a hot air balloon is. I didn't even realize we had left the ground and as I peered over the side of the basket, I was shocked to see just how high we were in the air. It is the closest feeling you will ever get to walking on a cloud. 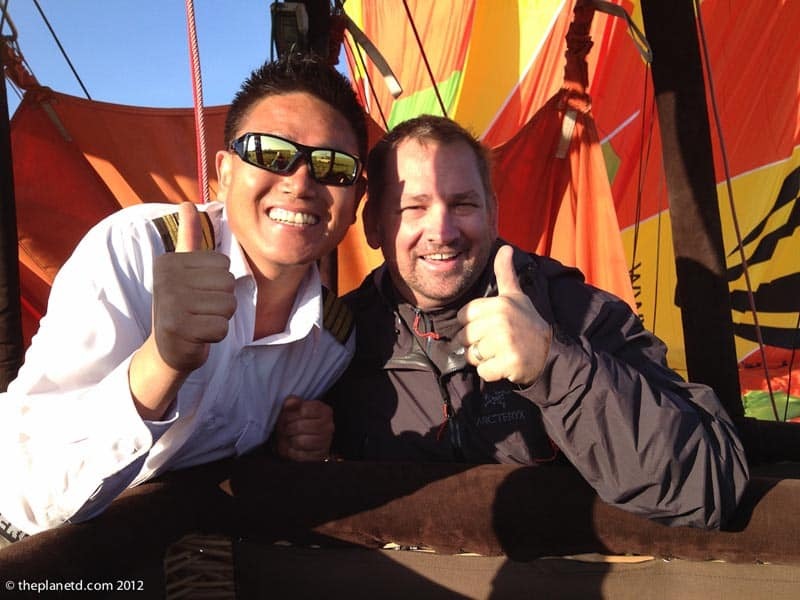 As we floated gently over the Masai Mara, Captain Kim chatted to us about our life and his. Captain Kim is from Korea but it was here flying high over the African Savanna that we realized just how small the world is. When we told him we were from Canada he replied that he used to fly hot air balloons in Canada. We assumed he would say somewhere like Vancouver, but no, he was based in London Ontario. A town near my parents home in Woodstock. He knew my parents home town Woodstock well as he often manned flights over Kitchener Ontario. Woodstock is dead centre between London and Kitchener! 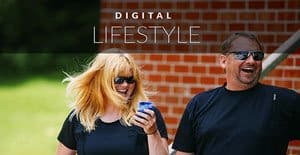 We talked about Tim Hortons and other locations that only small town Western Ontario residents would know about and had a grand time taking in the scenery while enjoying a very pleasant conversation. A flight over the Masai Mara is expensive. It starts at $450 but if you are going on a safari to Africa, it is a once in a lifetime experience. The landscape of the Masai Mara is beautiful. It's a vast open space filled with wildlife. 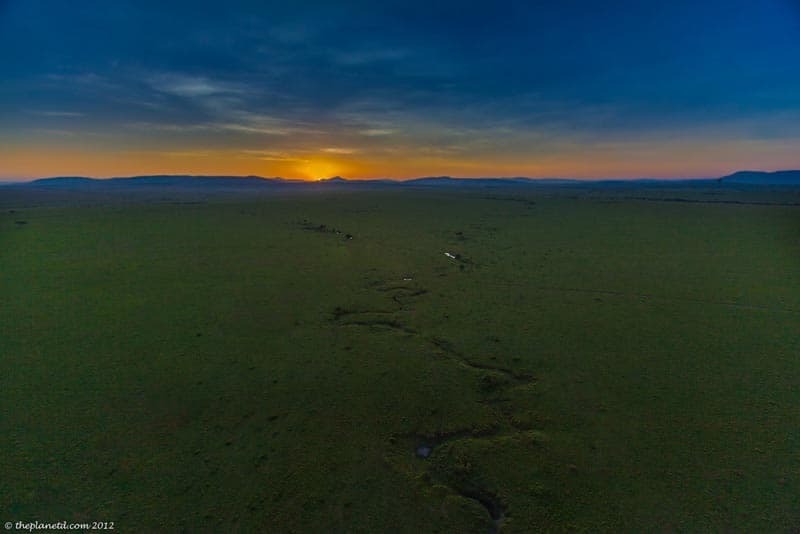 The millions of wildebeests and buffalo weren't running below as they would during the great migration, but we did see a birds eye view of Hyena's hunting, elephants roaming, gazelles and springbocks grazing and vultures flying. To fly over the trees and see a vultures next was eye opening. I did not realize just how much real estate a vulture takes up in a tree. Their next takes up the entire roof of the branches. We flew all the way to the Tanzanian border. The border is marked by a range of small mountains and we knew that we'd be landing soon as they approached. We were in the air for over an hour and as we started to lose altitude, we braced ourselves for a rough landing. 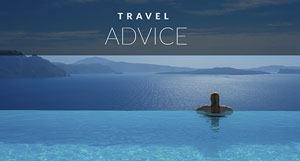 We have heard of many people having bumpy and scary landings so we assumed that we would have the same. Instead, we landed smoothly on the ground without barely a bump. Captain Kim is an expert at flying. He told us that the winds in Canada are extreme and flying in Africa is a cake walk after the windy conditions of Western Ontario. Most pilots cancel flights regularly (As what happened previously to us in Spain) but not him. He finds the little winds of Kenya to nearly always be easy to fly and today was no different. We had smooth sailing over the Masai Mara. But wait, our Hot Air Balloon Experience wasn't over! 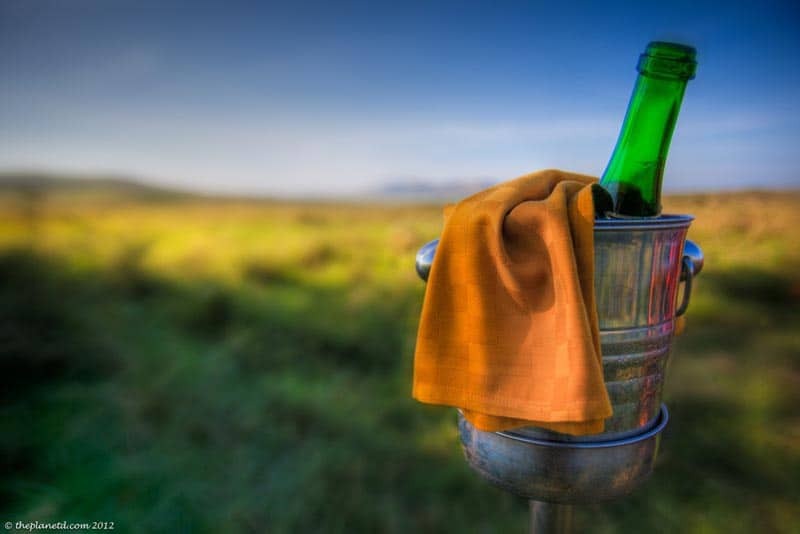 When you book a hot air balloon ride over the Masai Mara, a champagne breakfast is included! We hopped in our safari jeep to drive to a clearing in the middle of the reserve. 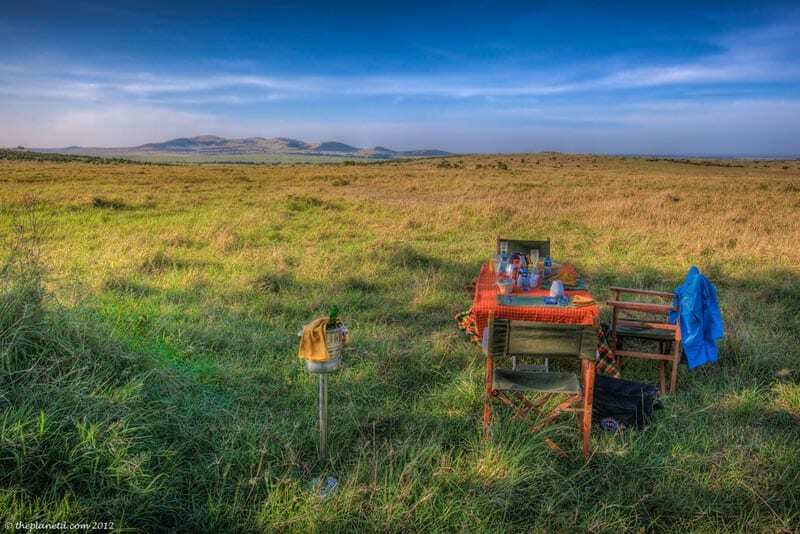 CAn you believe we're sitting right in the middle of the Masai Mara eating eggs and bacon and sipping champagne? When Dave had to go to the washroom, he was warned not to venture too far. You never know if a lion or leopard would be lingering around. The weather was perfect. The morning sun beat down warming our chilled bones from the brisk balloon ride. It wasn't freezing on the balloon by any means, but there was a bit of a bite in the air due to the wind and the early morning flight. We drank delicious Kenyan coffee, downed an entire bottle of champagne and went back for seconds of our ready to order omelettes. This is what decadence is all about. 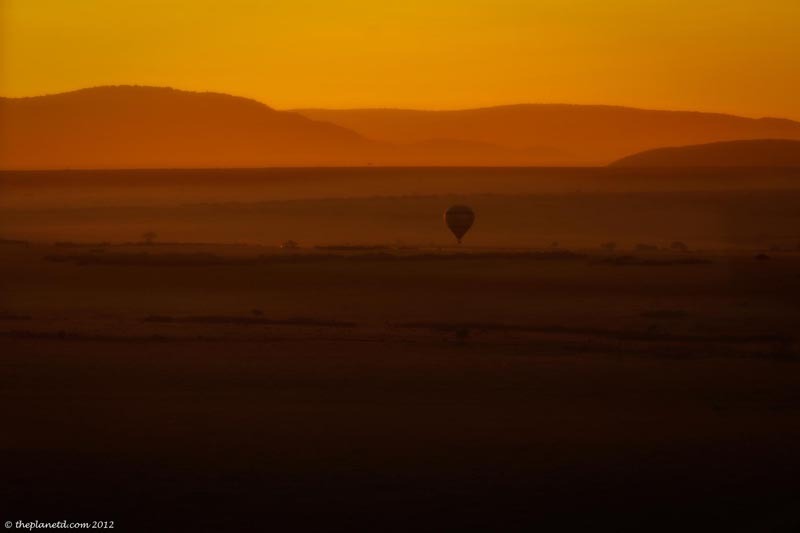 It truly felt like a dream to have this hot air balloon adventure in Africa. We have wanted to take this flight since watching Africa The Serengeti in 1994. While our balloon ride was over the Masai Mara, we did manage to fly over a very small portion of the Serengeti. Tanzania's Serengeti is right next door to the Masai mara. They are connected and the only difference is the name. Since we crossed the official Kenyan border and flew for a few minutes in Tanzania, we did fulfill our original dream of flying over the Serengeti. So our hot air balloon adventure had come to an end. 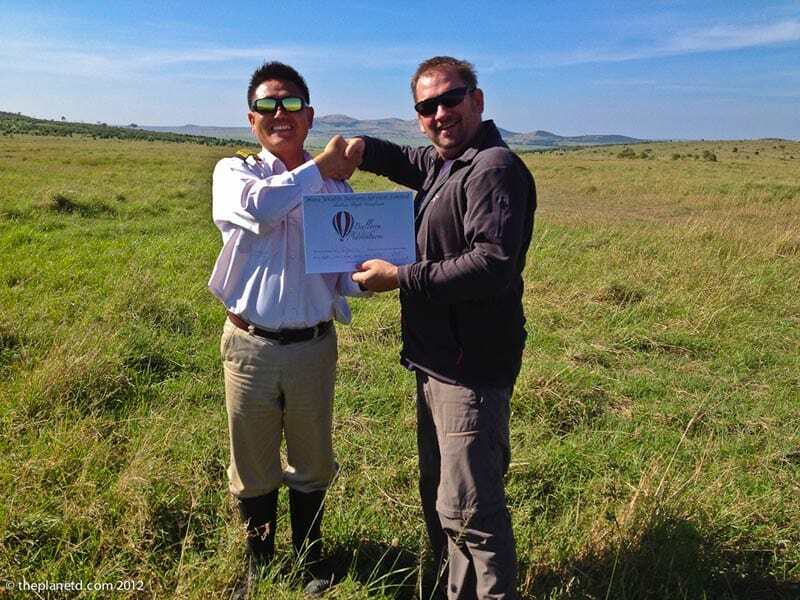 Captain Kim presented us with our flight certificate from the Mara Wildlife Balloons Services. We won't be able to pilot our own hot air balloon any time soon, but we've got the piece of paper to prove it, we “Venture Aloft over the Masaai Mara. 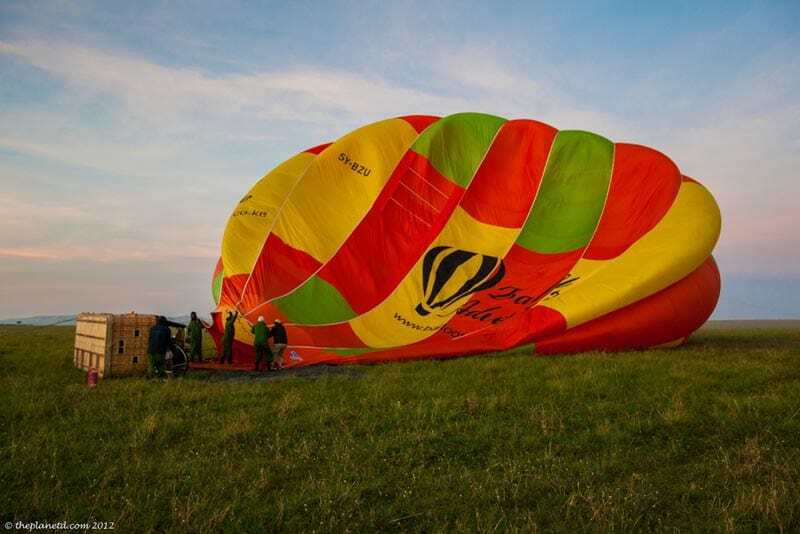 For more information on taking your own Hot Air Balloon Flight Over Kenya, check out Balloon Adventures and if you go, say hello to Captain Kim for us. Tell him, Dave and Deb from Woodstock say hello! 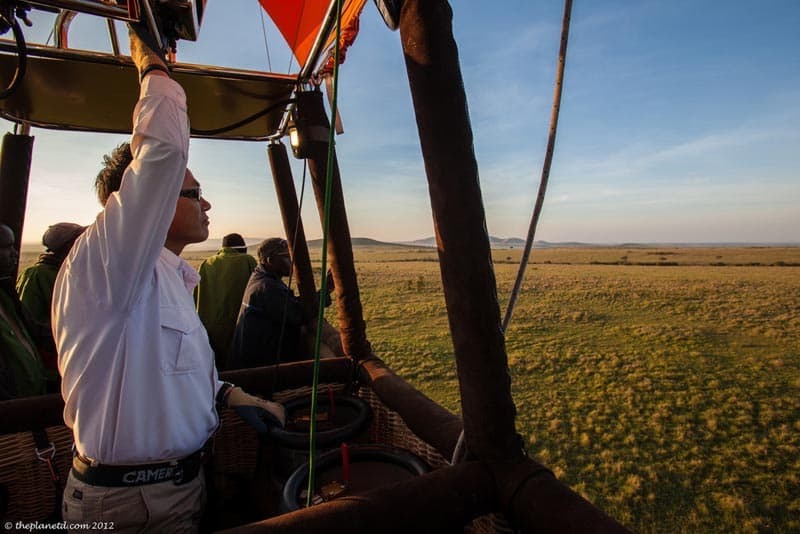 21 Responses to "Hot Air Balloon Masai Mara: Champagne and Flying High in Africa"
Deb n Dave! I wouldnt have explained the masai mara ballon experience any better. Nothing beats the feeling of silently gliding over the plains to watch the drifting sunrise and the waking predators in an endless savanah where one minute is never like the last. Thank you Robert, that means a lot, especially coming from someone who gets to see and do it regularly. It’s a truly special experience. Link doesn’t work, have they gone out of business? Wow, the pics from the hot air balloon are awesome. Thanks for recommending “Balloon Adventure”, the seem to do a great job. Thanks Zubi, yes, if you go to the Masai Mara for a safari, a hot air balloon is a must. 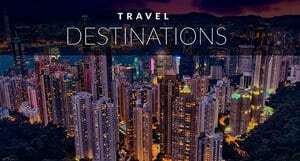 This is one of the Adventure Travelling. I like Africa is best for Adventure wild Travel. But you did a adventure flying in hot air Balloon in Adventure Africa….. It was a very cool experience. 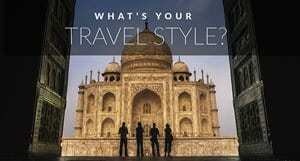 I remember seeing this exact moment on a travel show over a decade ago. We said to each other, ‘we have to do that one day!” and here we are, sipping champagne on the Masai Mara. Incredible. That is our dream hot air balloon adventure! I think we’ve shared with you before that we were actually married in a hot air balloon on an extremely windy morning. So really we were married in a grounded hot air balloon. That was 11 years ago next month and now after all this time and anticipation, not just ANY hot air balloon flight will do! It is worth the wait Jennifer. 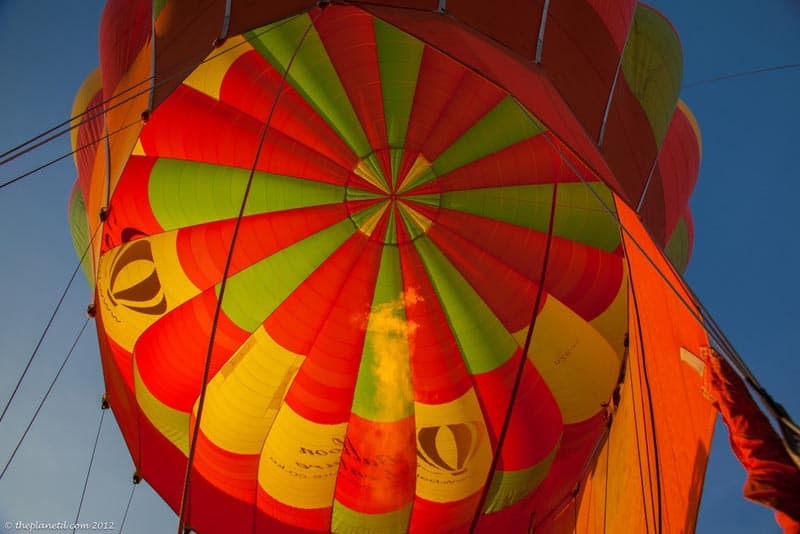 I’ve talked to so many people now who say it is common to have the hot air balloon flights cancelled. 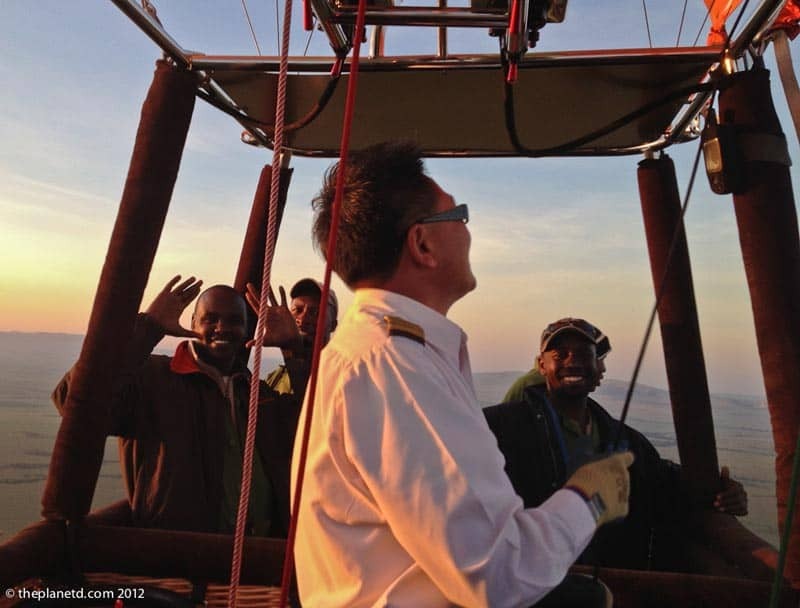 I didn’t realize that it happened so often, but Captain Kim tells us that in the Masai Mara, he rarely has to cancel a flight. That’s why he loves flying there so much. I’m sure you’ll be up in a hot air balloon in 2013! Wow! What a pretty view! I bet it was amazing to be all the way up there looking down at the beautiful view. I would love to get to do that someday. Whenever I think of Africa, I think of freedom. Such a vast and beautiful place. Everyone should visit it at least once in a lifetime.